TCI Inc.is a flexible ducting product made entirely of PTFE (Teflon) and rated for a constant temperature of 500°F. A new, 100% PTFE material with mechanical capability encapsulates a PTFE coil, resulting in a flexible, non-porous and non-flammable product that can be made cost-effectively to suit applications so corrosive that only all-PTFE materials can be used. Because of the PTFE coil, this product also has excellent elasticity. 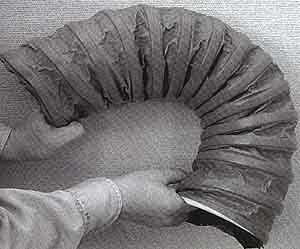 This duct springs back to its original round shape to allow maximum flow through the duct. This product can be used in positive and negative pressures regardless of the duration and severity of chemical exposure. Most diameters, lengths and colors are available. Flanges, cuffs and transition pieces of PTFE are easily sealed into this duct to provide a leak-proof fitting. The product can also be customized in terms of conductivity, thickness, abrasion-resistance and flexibility. , 105 Route 101A, P.O. Box 532, Amherst, NH 03031. Tel: 603-883-9932; Fax: 603-883-9956.